What Can We Do For Ingrown Toenails? Located in Sutherland and also proudly servicing Kirrawee, Engadine, Menai and Bangor, Sutherland Podiatry Centre offers care for ingrown toenails. Ingrown toenails can be one of the most painful foot conditions you may experience. I have had women tell me it is on the same level of pain as childbirth!!! Not to mention, that when you have an ingrown toenail, there must me a neon sign above you that tells everyone to stomp on it for you, on the train, the bus, or pieces of furniture seem to jump out and hit the area, no wonder it is painful! But let’s discuss this problem…. A nail becomes ingrown when the side of the nails cuts into the skin next to the nail. This can become very painful. This skin next to the nail can also become inflamed or infected. Any toe can be affected, it is usually the big toe that we see at our clinic. Poor nail cutting technique may leave a small sharp spike in the corner of your nail. 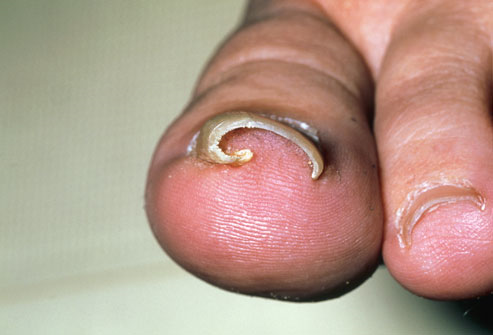 Cutting too far down the side of your toenail is one of the most common causes of ingrown toenails. Nail shape – some people are predisposed to getting recurrent ingrown toenails due to the shape of their nail. Their nail is more curved from side to side rather than being flat. These types of nails are usually genetic, so there is a family history of ingrown toenails. Trauma to the nail like dropping something heavy on the toe, can alter the shape of the nail, making them more prone to becoming ingrown. Footwear that is tighter is more likely to increase pressure on the nail plate, and between the skin in the nail fold and the skin. A good example of this is soccer boots. A lot of players like the very tight boot so they can ‘feel’ the ball better, and so at the beginning of soccer/football season we see a lot of ingrown toenails. A fleshy toe is more likely to have a nail grow into it. Those people whose feet swell are a lot more prone to having this happen. What is the treatment for ingrown toenails? Self Treatment– At home you should bathe the area in salt water after showering and dress daily with betadine and a bandaid until you are able to seek help from your podiatrist. Surgical Treatment – This is where all other treatments have not worked, or the nail is beyond conservative care. We perform a Partial Nail Avulsion under a local anaesthetic in our clinic. Here we remove the offending piece of nail, and phenolise the nail matrix, so in effect we remove the corner of the nail permanently. If this is a concern of yours please don’t hesitate, come and see us in the clinic, so we can get you out of pain now!